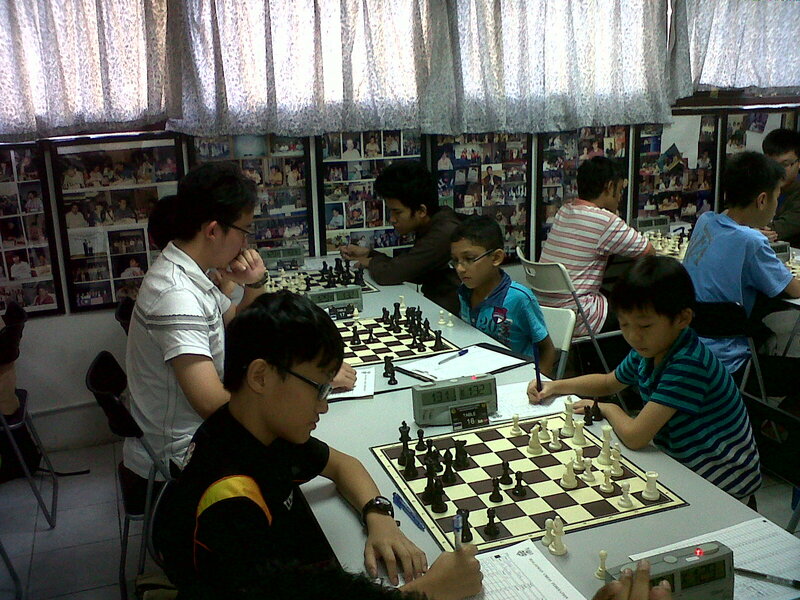 The fifth edition of Malaysian NJCC or National Junior Chess Championship is being held at DAT Chess Center. Today is Day 2 of the tournament which format is nine SWISS rounds of 90 minutes + 30 seconds increment. Two rounds completed yesterday on its Day 1. The tournament is divided into two sections - Boys and Girls. All the three children of GiLoCatur are taking part. Both Fikri and his younger brother, Fahim, are playing in the boys section. 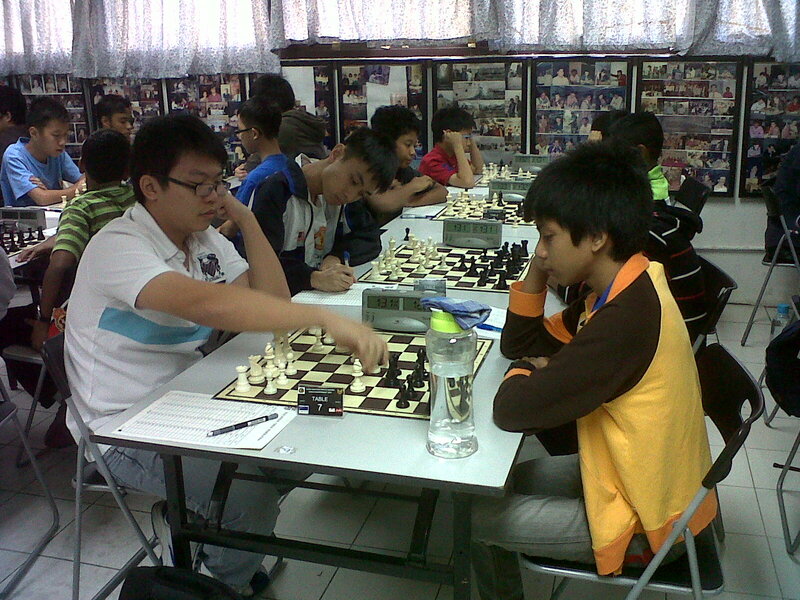 Fikri is seeded 18th out of total 56 participating boys with 1679 Elo rating. While Fahim is ranked 43rd with national ratings of 1370. Click here to see all the participants. 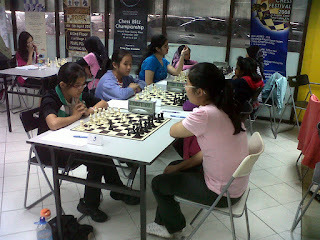 GiLoCatur's only daughter, Anis Fariha, is one of nineteen (19) Malaysian juniors who take part in the girls category. With Elo ratings of 1573, Anis is the 8th seed. Go to this link to find out who is the top seed in the girls section. Below are several photos of the 5th NJCC which GiLoCatur captured during the first round yesterday morning using BlackBerry. Best of Luck to all contestants especially GiLoCatur's children. Hopefully, they have better results than last year. For the record, Fikri was 12th, Anis was fourth and Fahim was 40th. GiLoCatur just heard the news of the demise of Mr Fang Ewe Churh from Malaysian popular chess columnist, SS Quah. Surely, GiLoCatur does not know well about Mr Fang but based on SS Quah's obituary in his blog, no doubt Mr Fang is one of the key figures in Malaysian chess history. A very big condolence to Mr Fang's family. Click here to read the obituary by SS Quah. For those who don't know about the formation of MCF i.e. Malaysian Chess Federation in August 1974, including GiLoCatur ofcourse, should read this article written by SS Quah who was there in the meeting which was chaired by none other than the late Mr Fang Ewe Churh. A special day for both GiLoCatur and wife. It was on this date seventeen years ago that our marriage journey began. How do we celebrate it? Watching our three sweet kids - Fikri, Anis Fariha and Fahim Al-Faqeh, take part in the 3rd National Rapid Chess Championship at the UTP's main hall. GiLoCatur and family checked into a homestay at Taman Maju on Friday evening after making an hour journey from Teluk Batik. We spent one night at the Nipah Bay Village in Pangkor Island or Pulau Pangkor in Malay. It is one of GiLoCatur's favourite places to visit. One of the reasons is that it was the honeymoon spot for GiLoCatur and wife. We arrived at the championship venue at around 9.30 in the morning. Many participants especially for the age group categories had already arrived with their respective parents or accompanying adults. For playing purposes due to small amount numbers of participants in some age groups, Under 8, Under 10 and Under 12 are merged into Under 12 category. Meanwhile, both Under 14 and Under 16 are merged Under 16 category. 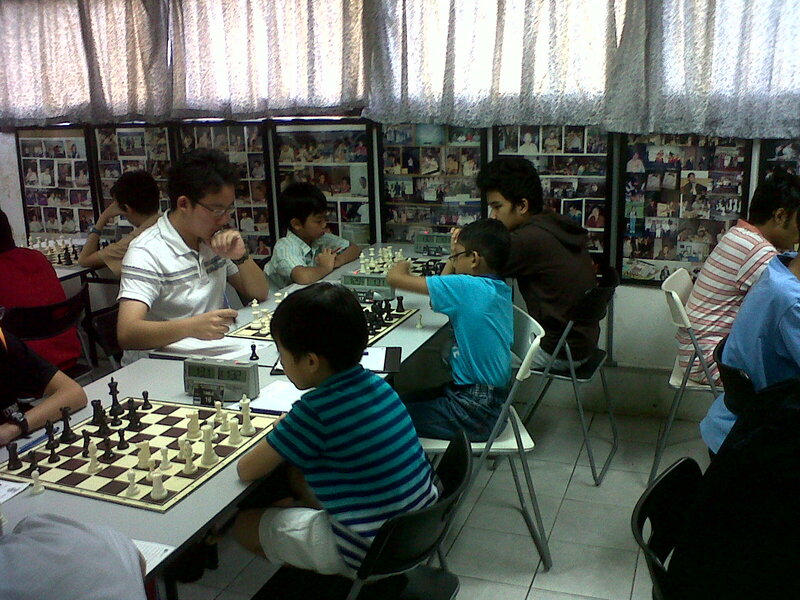 Fahim has been registered in Under 10 category, Anis in Under 14 and their elder brother, Fikri, in the Open category. Therefore, Fahim has to play Under 8, Under 10 and Under 12 opponents. Anis, on the other hand, will play against either Under 14 or Under 16 opponents. Fikri will have tough chess opponents in the Open category which is a FIDE-rated event. It will be his first FIDE-rated rapid tournament. There are 73 participants in the Under 12 section which consists of three age groups - U8, U10 and U12. With national ratings of 1370, Fahim is seeded 6th. Seven rounds had completed on the first day of the two-day tournament. Fahim has scored 5/7 points. 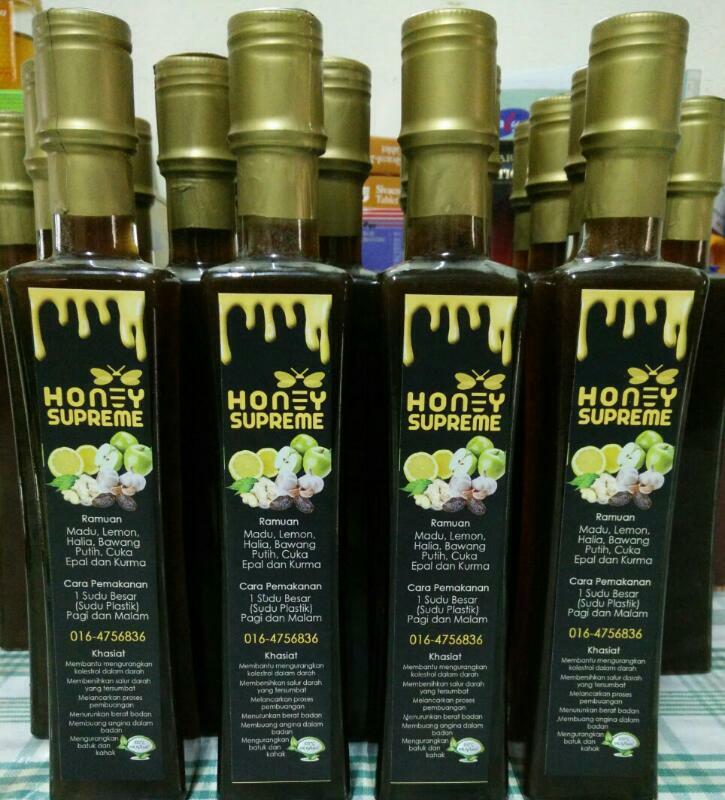 The leader for this section is a Kelantanese boy named Nik Muhammad Haziq Najmuddin who has accumulated 6.5/7 points. Can Haziq live up to his top billing to emerge as the top scorer in this section? It is very obvious from the starting rank list here, Under 14 players are dominating the Under 16 section. The top rank is Dilwen Ding Tze How, a MSSM WP player. Anis is ranked third rated at 1585. After seven rounds, she has scored 6/7 points maintaining her third position. 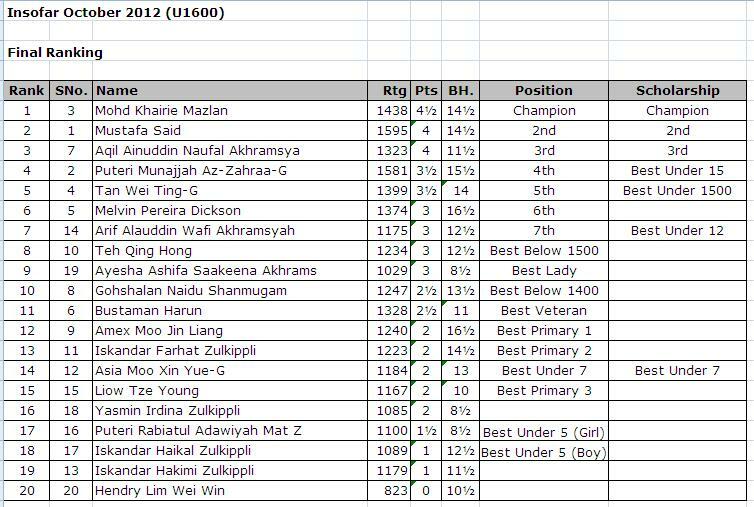 With perfect 7/7 score, Dilwen is leading seventy four players in the Under 16 section with one point margin.It looks unstoppable for Dilwen to emerge top in the section even though Anis will be his next opponent tomorrow (Sunday, 18th Nov 2012) morning. In the Open section, 47 participants take part including two Filipino strong players. Four players share the top position with 6/7 points. Fikri has scored 4/7 points after winning four games. He fumbled a winning edge game to an experienced local player in the fourth round. Today is Tuesday, 13th November 2012. It is a public holiday. 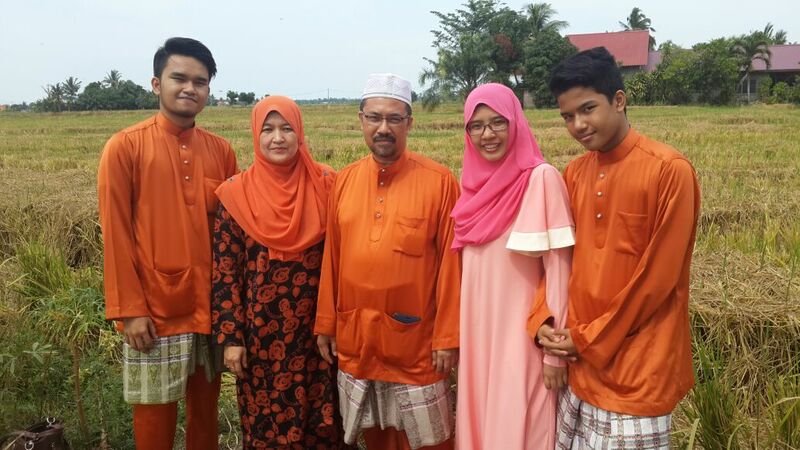 It is a special day for GiLoCatur's family especially to Fikri, the eldest child in the family. Why it is so special? The answer is that it was on this date sixteen years ago that Fikri was born. Fikri's birthday is a bit special to GiLoCatur and wife, not only because he is our first child but because his birthday is few days away from our marriage anniversary. This year will be the sweet 17 anniversary for GiLoCatur and wife. Alhamdulillah, Fikri makes GiLoCatur and wife proud and happy. Hopefully, he will continue to be like that. Next year, he will sit a big examination which is SPM. An exam that will determine his future life direction. Therefore, his chess activities will surely be lessen and reduced. Last week on Tuesday, GiLoCatur was so proud and joyful when Fikri walked to the podium to receive his certificate and "watch" gift for being a member of a MSSM team champion in the L18 category of chess competition. Most gracious to the Almighty Allah! Hopefully, Fikri will continue to be a champion in many years to come. "SELAMAT MENYAMBUT ULANG TAHUN KELAHIRAN KE 16 BUAT ANAKANDAKU, FIKRI! SEMOGA ALLAH SWT PANJANGKAN USIA UNTUK TAAT KEPADANYA DAN PESURUHNYA, MURAHKAN REZEKI, BERIKAN KEJAYAAN DAN MERAHMATIMU ... amin amin ya rabbal alamin"
SUKIPT Chess is going to end tomorrow. The final 11th round will be held tomorrow morning. Three rounds completed today (Saturday, 10th Nov 2012). The tournament is in the climax phase. So, who are leading both the men's and the women's category? What were the thrilling results today? It is quite interesting in the 8th round because Nurul Najmi from UIA managed to hold the top seed, Xin Ting, to a draw. Losing to Siti Nor Raihan (UIA) in the 9th round surely a frustrating result for Tszee Yeung (UPSI). In the 10th round, it was Raihan's turn for a disappointment. 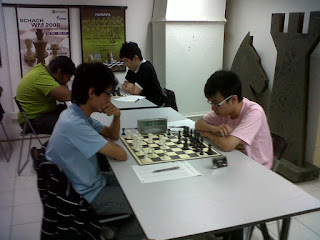 USM player, Choon Yong, beat Raihan playing black. Nurul Najmi (UIA) had the same fate as her team mate, Raihan, losing to Lee Yin (USM). Should she won, she would join Tszee Yeung and Choon Yong in the 8 pointer group as well as Raihan. The fight has yet finish especially for both silver and bronze medals. Ahmad Fadzil Nayan of UIA is currently leading the men's category. 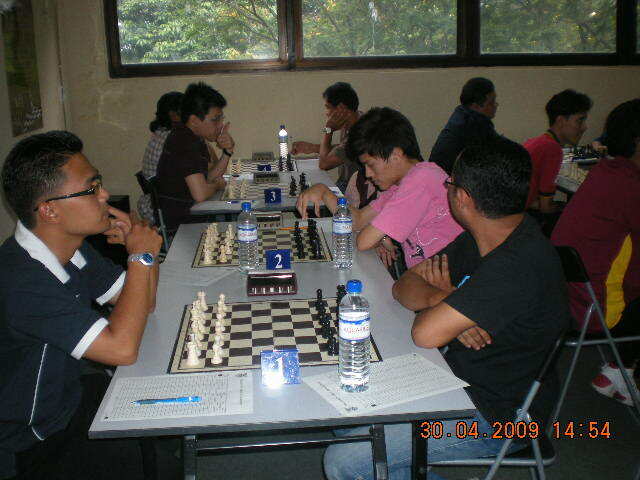 In Round 8, he drew for the first time against Syazwan of UM. In the next two rounds after that, Fadzil scored two more points. That means, having just one draw from the total of ten rounds, he has accumulated 9.5/10 points. Trailing one point, Ian Siah is currently at second place with 8/10 points. Three players are having 8/10 and 7.5/10 each. 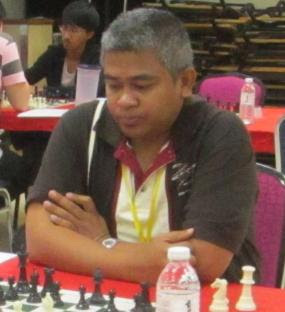 Fadzil just needs half point from his final round against Chek Kin Keuw of UPM to seal his glorious achievement in the SUKIPT Chess. If Kin Keuw manage to win and Ian Siah wins over Syazwan at Board No 2, the championship will be determined by the tie break because both Fadzil and Ian Siah will have same 9.5/10 points. For sure Fadzil will make sure the individual gold medal is his. The battle of Table No 3 is also very important especially for both Xin Hao if USM and Abdullah Khairi KZ of UIA. The winner most probably will win the medal. GiLoCatur strongly believes that both Guan Xin Ting of UPSI and Ahmad Fadzil Nayan of UIA will be the champions and Gold medal winners. Let's find out tomorrow! GiLoCatur is very impressed with the pairings & results of SUKIPT chess at the chess-results.com. It is published before the next round starts. Hopefully, it will be like that until the end. So, can Siti Nor Raihan overcome the women's top seed, Xin Ting, to continue her perfect winning score? Can Ian Siah stop the men's top seed, Fadzil Nayan from his winning streak? So what are the results of the top boards of both the men's and women's sections? Let's GiLoCatur answer one by one. In the women's section, Siti Nor Raihan of UIA unfortunately could not continue her winning streak. Her opponent, Xin Ting of UPSI, maybe too strong for her to defeat. For sure, she will be heartbroken for this result but she should pull herself back when playing at Board No 3 this afternoon in the 7th round against KBU player, Suet Yuan. 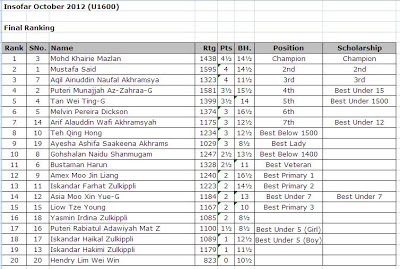 The win of Tszee Yeung over Lee Yin of USM for sure makes UPSI's chess coach, Ezmi, proud and happy. He would be double joy happy if another UPSI player, Izza Hasrina, could win over her USM opponent, Choon Yong at Board No 4. In the men's section, Ian Siah could not stop Fadzil of UIA to win six consecutive games. The latter is one round closer to become the individual Gold winner. Both Syazwan (UM) and Xin Hao (USM) managed to win over their respective lower-rank opponents. At Board No 4, Wan Aizuddin of UPM upsets his higher-seeded opponent. While at Board No 5, Nabil Azman of MMC drew with UMS player, Jeppy Tewelu. 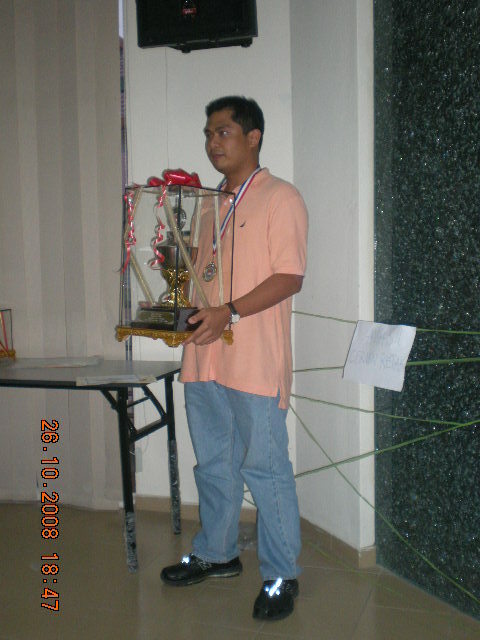 Jeppy is not a stranger to GiLoCatur as he was the L18 category MSSM champion in the 2010 edition. Nabil needs to avoid another slip up if he wants to challenge Fadzil for the championship. Their points are 1.5 adrift. Will both of the top two seeds ever meet in this tournament? Will Fadzil continue his winning streak in the next round when he will be challenged by Xin Hao of USM who is trailing halfpoint? Let's wait to find out. The SUKIPT chess competition becomes hotter and hotter. Who will emerge as the champions? Who will represent Malaysia in the Kazan's Summer Universiade Games? 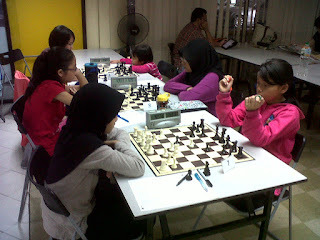 GiLoCatur dropped by today at the Polytechnic of Sultan Salahuddin Abdul Aziz Shah, the venue for 2012 SUKIPT Chess. Round 4 was on-going. 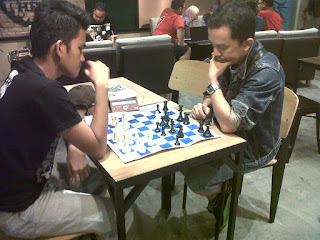 GiLoCatur had the chance to greet Ustaz Abdul Rahman, the author of http://percaturan.blogspot.com/. He is one of the arbiters. 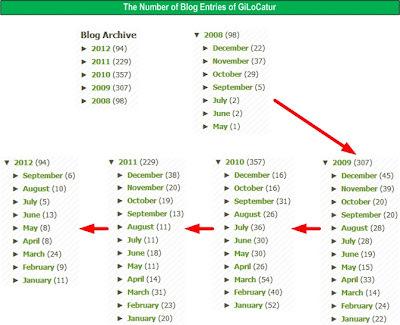 GiLoCatur believes he is influential and the key person in having the results posted and published at the chess-results early. Below are the Top 4 boards in the women's section. The top board match between Siew Ting of Taylor's University and Xin Ting of UPSI is among the last two matches to finish in the women's section. 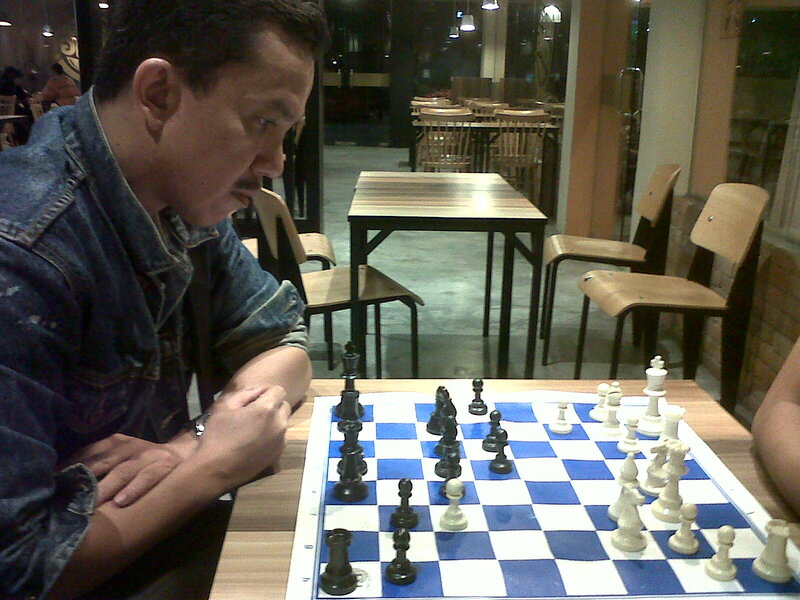 GiLoCatur believes whoever win this match might become the champion. At the end, Xin Ting who hails from China wins the battle. In the Round 5 which started 45 minutes ago, she plays white against the 9th seed, Lee Yin of USM who in Round 4 defeated an unrated opponent from IIUM or UIA named Nurwahida Atika at Board No 4. Izza Hasrina from UPSI won on time against her USM opponent, Sok Lin at Board No 2. At the 3rd Board, Siti Nor Raihan from UIA who is rated at 1476 plays white against her opponent from UiTM, Putri Nurfariza. 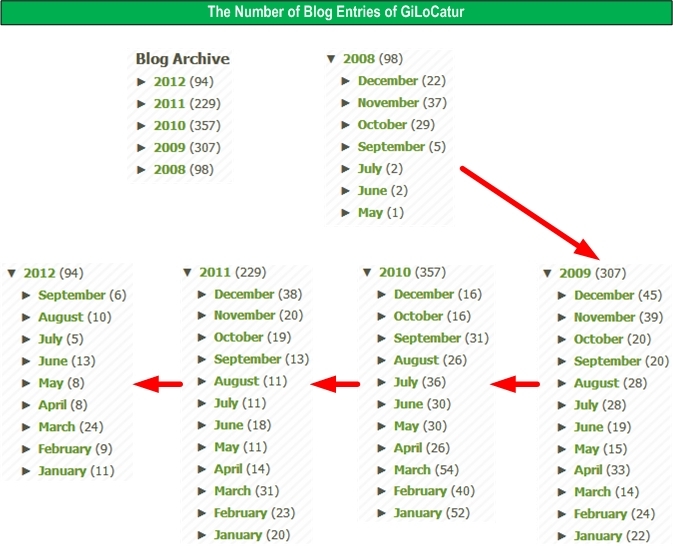 Searching GiLoCatur's Blog, Putri was the first runner up in G18 category in the National Age Group (NAG) 2010. She took part in the Beijing Asian Youth Invitational. 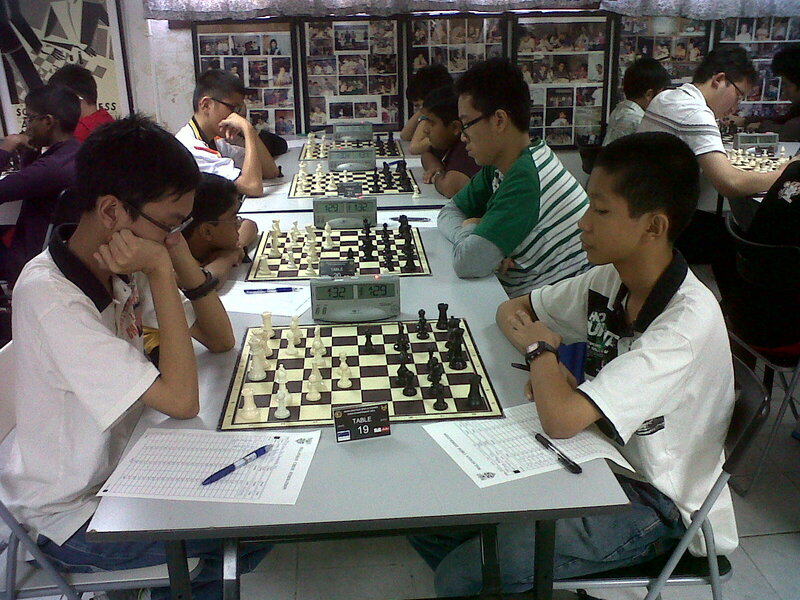 This 3rd Board battle finally was won by Nor Raihan. 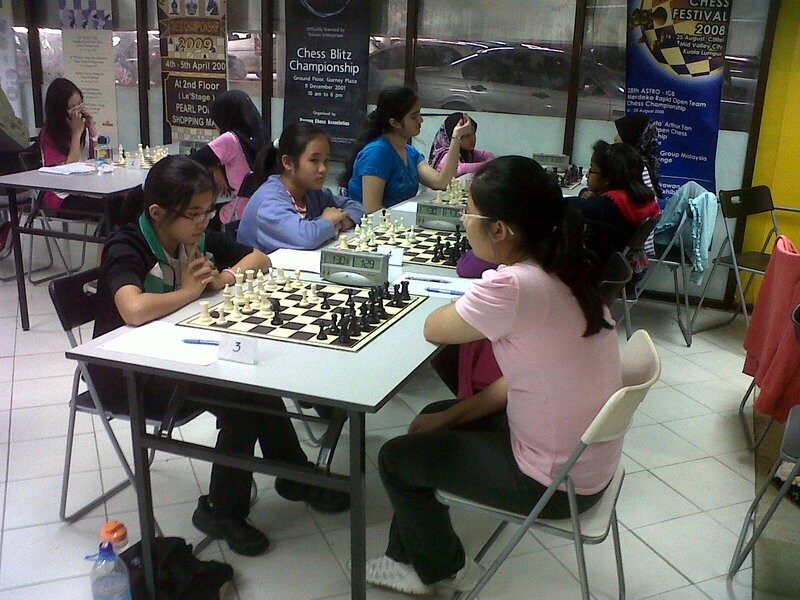 The 4th Board battle in the women's section is between Nurwahida Atika of UIA and Lee Yin of USM. The latter won and scored the important one point. The top seed Ahmad Fadzil of UIA was challenged by UTP player, Ramone Mikgail Kok. 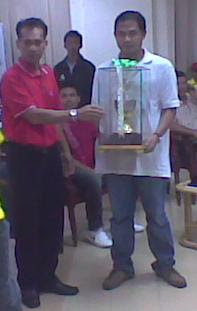 GiLoCatur started to know about Ramone last year during the 3rd Penang Heritage Open. 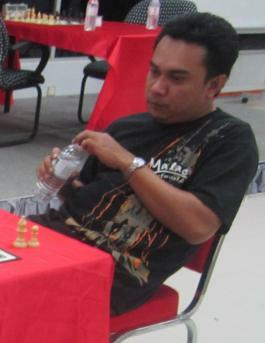 He drew with GiLoCatur's daughter, Anis, in the fourth round. From then on, GiLoCatur noticed that Ramone has been improving a lot. But he could not tame Fadzil who is one of the Malaysian players participated in the 2011 Summer Universiade in Shenzhen. At Board No 2, UM player Syazwan drew with his UNITEN opponent, Taione Sikivo who is rated 300 below. Sikivo is not unknown in the local chess scene since he has participated in the local chess tournaments quite often. Syazwan vs Sikivo match was among the last matches to finish. It had not yet finished when GiLoCatur left the venue. Based on their board position like below, GiLoCatur was confident that they would draw. About two hours ago, GiLoCatur went to Politeknik Sultan Salahuddin Abdul Aziz Shah which is just nearby to GiLoCatur's office. Actually, it was the first time that GiLoCatur entered the institution building. Why GiLoCatur visited the polytechnic you may wonder? The chess event of SUKIPT, the short form of Sukan IPT or the Higher Education Ministry Games kicked off today at 11.30am. About 250 players from different Malaysian higher learning institutions will be competing in eleven SWISS rounds beginning today until Sunday. 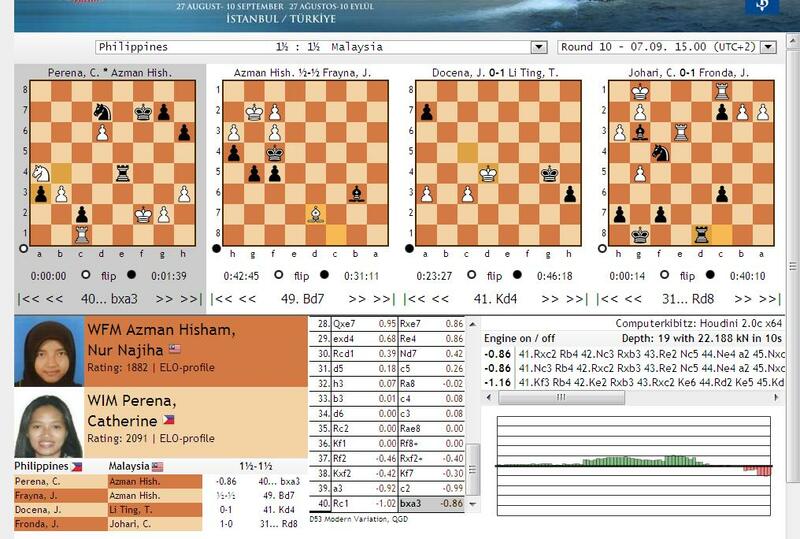 Four Gold medals are at stake for chess event in SUKIPT - Individual both men and women and Team both men and women. Who are the hot favourites to win the Individual Gold medals? Which higher institution will emerge as the champions in the team event? In the LELAKI event, GiLoCatur picks Ahmad Fadzil Nayan (IIUM) and Muhammad Nabil Azman Hisham (MMC) as the hot favourites. Both of them are the top seed and 2nd seed respectively. Their top challengers shall be Muhammad Syazwan Zulkifli, Looi Xin Hao and Ahmad Fariz Ahmad Shafruddin. 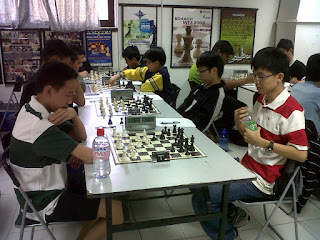 Except Xin Hao, the others are familiar faces and regulars in the local chess tournaments. You can follow the results here. In the PEREMPUAN event, GiLoCatur picks Norhaida Hussin and Kwan Tszee Yeung as the hot favourites. The former represents IIUM (UIA in Malay) while the later represents UPSI, a teachers university. Neither both of them is the top seed. The top seed is Kwan's team mate, Guan Xin Ting who hails from China.The other two Top 5 Ranking players are Nor Atiqah Mohd Niza and Aisah Reduan. 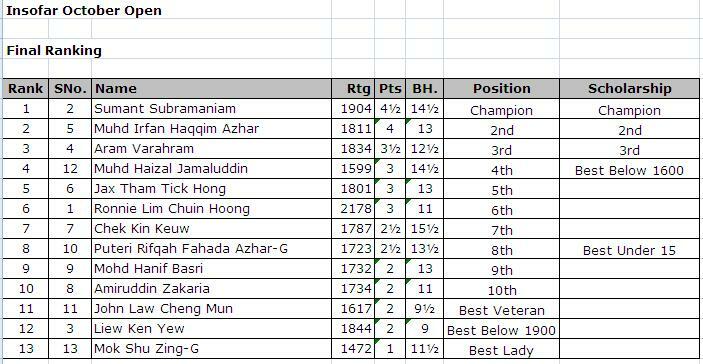 Beside these five top seeded players, GiLoCatur would like to follow the results and performance of Putri Nurfariza Ahmad Darji who represents UiTM. 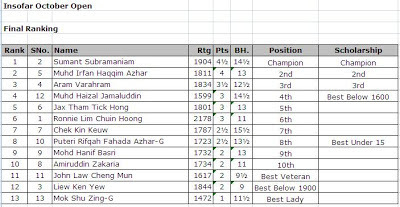 If GiLoCatur's memory is right, she was once the individual P18 champion in the MSSM chess competition. Follow the results here. GiLoCatur strongly believes that all the competing players will play their hearts out since the Gold medallist might be awarded a scholarship. In addition, this SUKIPT chess event most probably be the platform for the selection to the 27th Summer Universiade in Kazan, Russia in July next year. 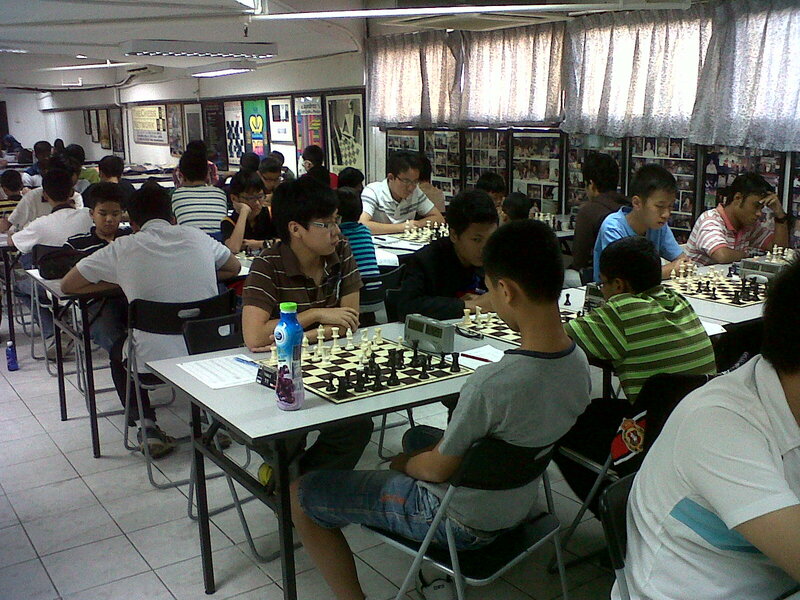 GOOD LUCK to all the participating players in the SUKIPT Chess! Below are the photos of the event's venue. Burger King Chess Sparring Session With MAX! It is quite sometime that GiLoCatur had not have chess sparring session. 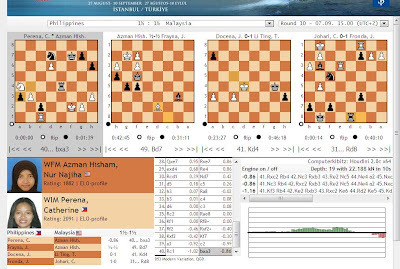 Last friday night, Max of 17ChessClub was so kind to have a chess sparring which GiLoCatur prefers to call "Burger King chess sparring" with GiLoCatur and Fikri. 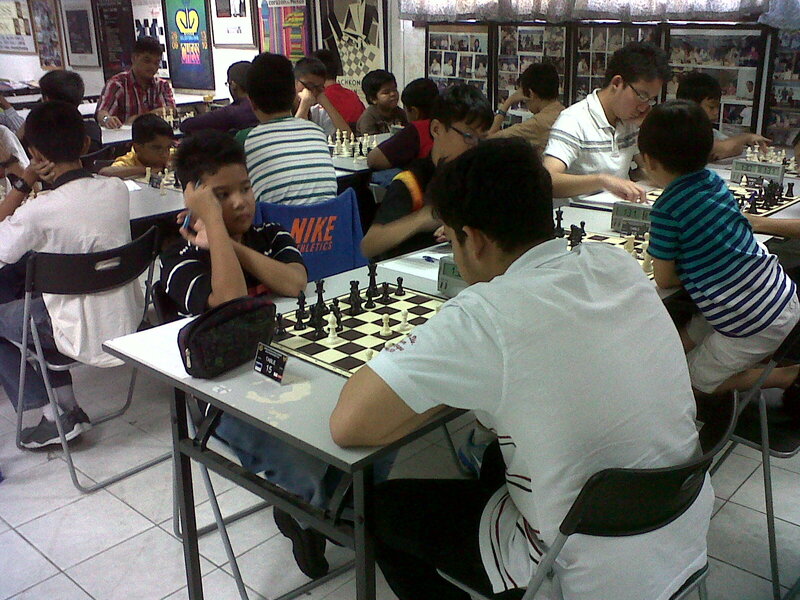 Both Fauzi Ahim and Ng6, two of GiLoCatur's chess buddies, could not make it. It would be much much more fun if both of them could attend. In chess war, having more soldiers (i.e. pieces) than your opponent does not ensure your winning. You may lose to better tactics and strategy. Chess also teaches you to be patient in your moves. It is important to check your King's safety and defend first before you make aggressive (offensive or attacking) move. Below game between two players in the recent CAS Allegro that GiLoCatur noticed is a good example. To the knowledge of GiLoCatur, black player in the above game is not a novice or beginner. But losing the above game shows that he/she was impatient and overlooked his/her playing-white opponent. No doubt, black has a clear winning advantage for having more pawns (even having one pass pawn) and one extra piece which is a Knight. 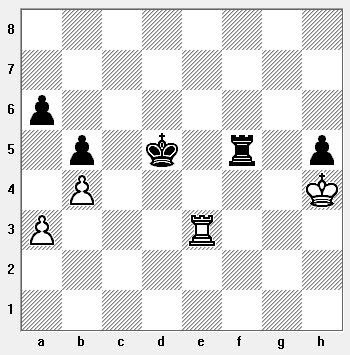 But black player allowed white player to have the black King to be on f7 square while white rook has control over h file. White's King should be moved onto either g8 or g6 square and then maneuvered his/her attack. Miscalculation! GiLoCatur believes that is the reason for black player to lose this game. That is the beauty of chess. Having less pieces but with better tempo and strategic piece position, you can be the winner.